September is peak time for apples in Minnesota, and the news for apple lovers this year can be summed up in one word -- Zestar! It's the latest variety developed by the apple breeders at the Minnesota Landscape Arboretum's Horticultural Research Center in Chanhassen. Apple breeders have been creating, testing and eating apples at the center for almost 100 years. The U of M's chief apple research scientist took us on a tour of the orchards. Chanhassen, Minn. — The main trait of an apple breeder is patience. It takes researchers about 30 years to develop a commercial apple ready for the consumer. The 15,000 young apple trees in the field of Farm 2 represent years of work for Dave Bedford and the other apple researchers at the Horticultural Research Center. "This sea of trees you see in front of us here will possibly produce one or two named varieties, somewhat like Honeycrisp or Zestar!" says Bedford. That's right -- only one of the 15,000 trees currently growing in the Research Center's orchard will actually be named and released to the public. The center will destroy the rest. Researchers established the university's fruit breeding program in the western suburb of Chanhassen in 1908. 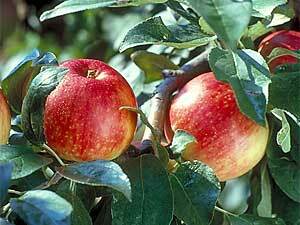 The center's goal is to develop apple varieties that will thrive in Minnesota, despite the cold winters. It took breeders about 15 years to develop their first successful Minnesota apple, the Haralson, which was released in 1923. Next came the Fireside in 1943 and Sweet Sixteen in 1978. Other familiar varieties, such as the Regent and the Honeygold, were also developed at the U. The center's chief apple breeder, Dave Bedford, has been at the center for 25 years. His eyes light up when he talks about one of the first apple varieties he brought to market -- the Honeycrisp. "That is an outstanding apple. I would have to say that's probably the pinnacle of our breeding success here. It has moved to No. 1 in Minnesota," says Bedford. "The interesting thing is it's getting quite a bit of national and even international attention now. While our varieties have always been loved in the upper Midwest here, we're getting much wider exposure with Honeycrisp." The center released the Honeycrisp in 1991. Bedford says not much has really changed for apple breeders since the Haralson was brought to market in 1923. The first step involves finding good "parent" trees. The researchers look for 25 characteristics -- including size, taste, color and appearance. The breeders germinate and plant seeds from the parent apple trees. They have to grow five to seven years before the trees can bear fruit. Researchers constantly monitor the new trees, and once the apples ripen it's time to sample the fruit. The early apples have been sort of a weak link in the apple industry here. Most of them tend to be soft and don't store very well, and have varying degrees of good flavor. But Zestar! is a standout. "In the course of a normal day of sampling I'll probably taste between 500 and 600 apples. Now of course, I'm not eating 500 to 600 apples! But you learn pretty quickly to chew them -- to maybe get the flavor and maybe swallow the juice -- but then most everything else gets spit out," Bedford explains. "So it's a slow process in that regard, because ultimately we can't just put these apples into a machine and have it print out which one we should keep. The decision still has to made with human judgment." Once the researchers find an apple they like, they make cuttings from the tree and a new breed of apple is planted. Bedford says the research center has another winner in the new Zestar! apple. Evidence of the researchers' belief in the Zestar! is present in the apple's trademarked name -- which actually includes the exclamation point at the end. The center released Zeststar! to growers in 1998, but Bedford says it's just starting to crop up in markets around the region. He says the Zeststar! fills a need in the market -- growers have been looking for a flavorful apple that ripens in August. "We feel that the early apples have been sort of a weak link in the apple industry here," says Bedford. "Most of them tend to be soft and don't store very well, and have varying degrees of good flavor. But Zestar! is a standout." Dave Bedford says as an apple breeder, he will be lucky if he can develop four or five new apples during the course of his career. "The job of an apple breeder is similar to being stranded on a desert island somewhere, with maybe 10 miles of sand beach in front of you. And somewhere out on that beach is one or two diamonds. And your job for the next 20 years is to walk up and down and look for those diamonds," says Bedford. "And of course, you go through a lot of sand and a lot of debris before you find the diamonds. But when you find a good one like Honeycrisp, it's well worth it." Bedford says Zeststar! is another variety that is worth all the time it took to develop it. He's so confident in the apple's taste that he wanted to test it on some skeptical eaters -- journalists in the MPR newsroom. The first to test the new ZestStar! was online editor Bob Collins. "Oh, it's great," Collins said. When asked to describe the taste, he put it this way. "I'm not really an apple aficionado, but it has a little bit of a slight kick to it -- not much -- and it's sweet," he said. Next is reporter Lorna Benson. "That's great! But it's making me salivate excessively," Benson laughed. Finally, reporter Mark Zdechlik tried the Zestar! "It is good, but it's not as crunchy as I thought it would be -- especially for a brand new one. It's not mealy either but it's kind of soft, and not as crunchy as a Braeburn or something," Zdechlik said. The new crop of Minnesota-grown Honeycrisp apples and the other varieties developed at the Minnesota Landscape Arboretum's Horticultural Research Center should be at their peak this week.